Going on this eczema diet has been bad and good. The down side to this detox is going out with friends. Most restaurants do not cater to the food sensitive folks. Yes a lot of restaurants have gluten free foods, but to compensate for the lack of taste, they may add cheese, sugar or eggs. Most salads have bacon, croutons, vinaigrette or cheese. I am not the type of person to ask the waiter to customize my plate so I usually just try to find a dish that will cause the least amount of damage. (Plus it is like my little treat) I look for ones with lots of veggies and rice or potatoes. I might just order a chicken salad. Some good things about this diet is that I have learned a lot more about myself and have experimented with new dishes. 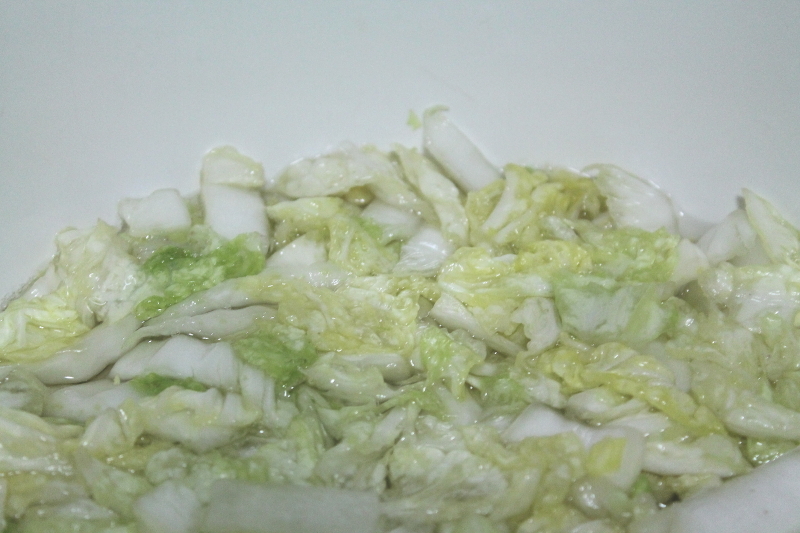 One dish that I have always been trying to make is kimchi and cultured veggies. OOOH all those probiotics. Probiotics are awesome for you. They help your digestion. 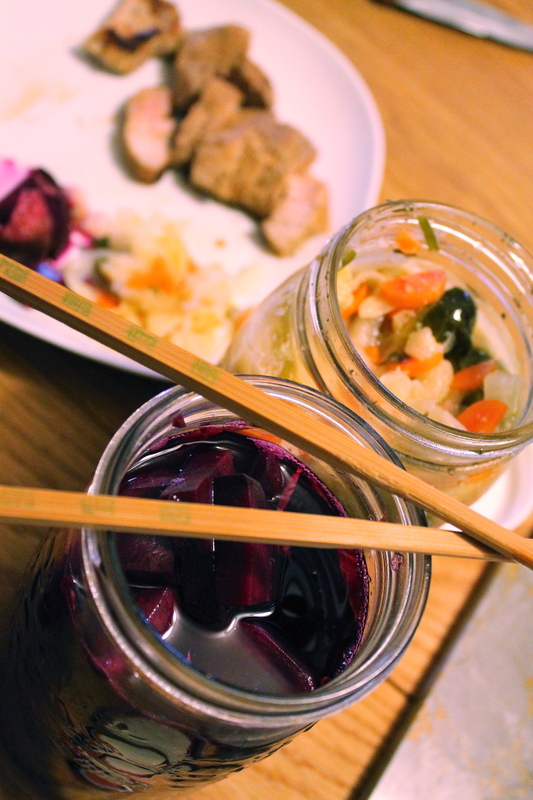 To start your kimchi, you will need to prepare your ingredients and wash and sterilize your jars. It is important to wash your veggies thoroughly as you will not be cooking them. 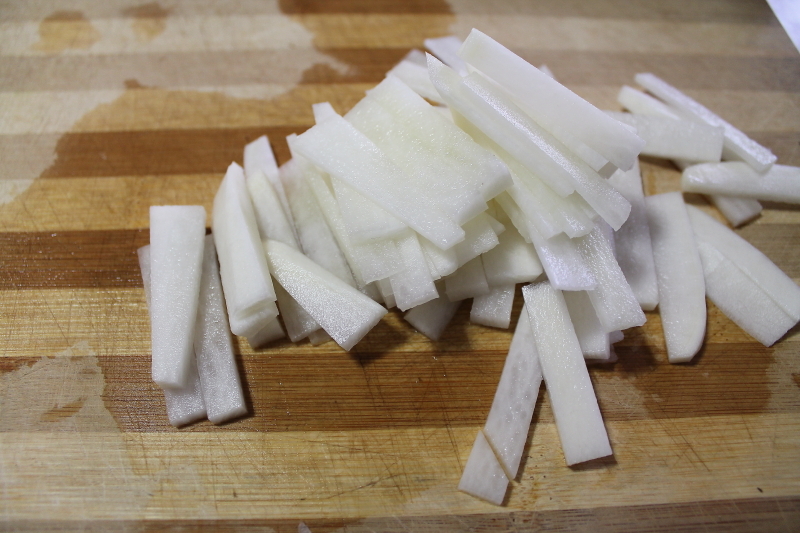 For kimchi, you need one head of savoy cabbage (sui choy), one daikon (white Asian radish), one onion, ginger, apple pear, carrots, garlic, green onion and korean pepper. I couldn’t find Korean pepper at my local market so I decided to use red pepper instead. My final kimchi lacked the red coloring that traditional kimchi has. I also decided to add brussel sprouts to my recipe. The result was awesome. 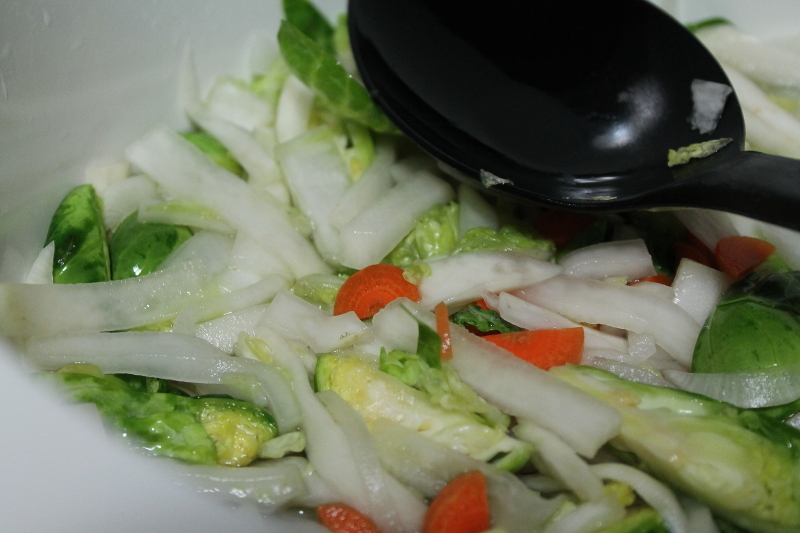 Slice up the brussel sprouts, cabbage, carrots and daikon into bite sized pieces. Add brine to the mixture and allow to sit for 2-4 hours. After a couple of hours, the water will start coming out of the vegetables. Keep pushing the vegetables under the brine. 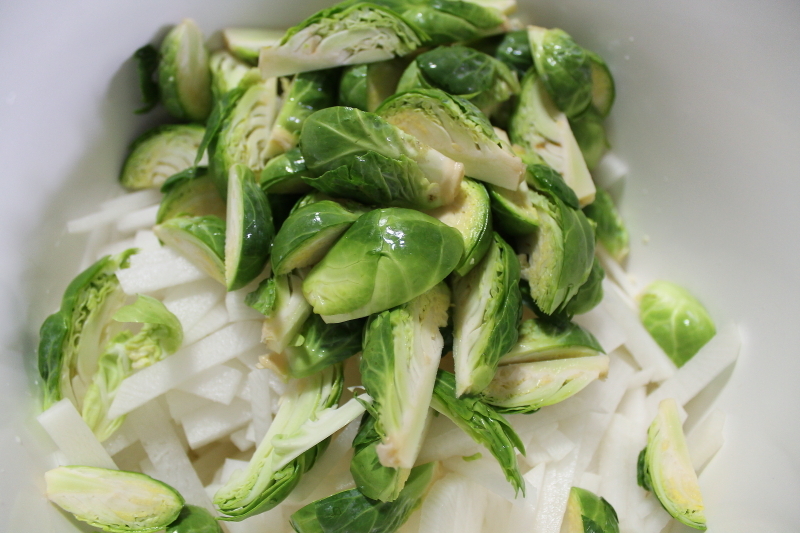 To help keep the veggies covered in brine, you can put a plate on top of the veggies and place something heavy on top. While the veggies sit, you can make the sauce. 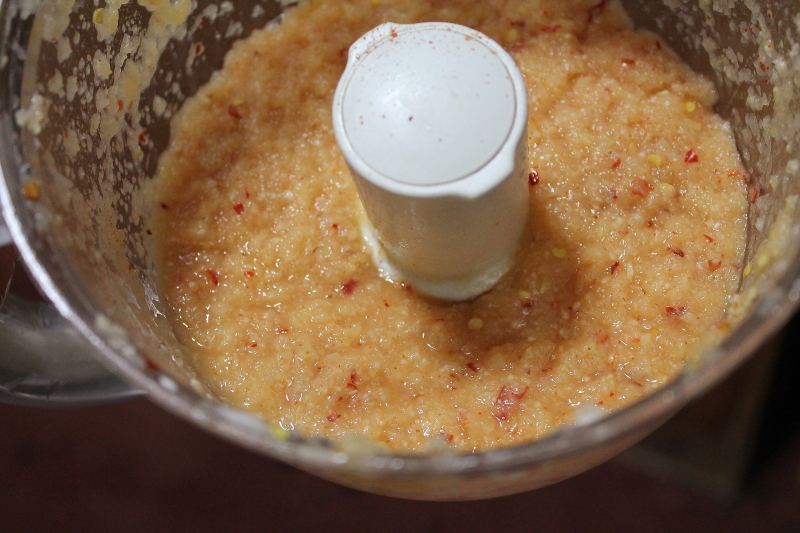 You will need onion, ginger, garlic, chilli peppers, and apple pear. 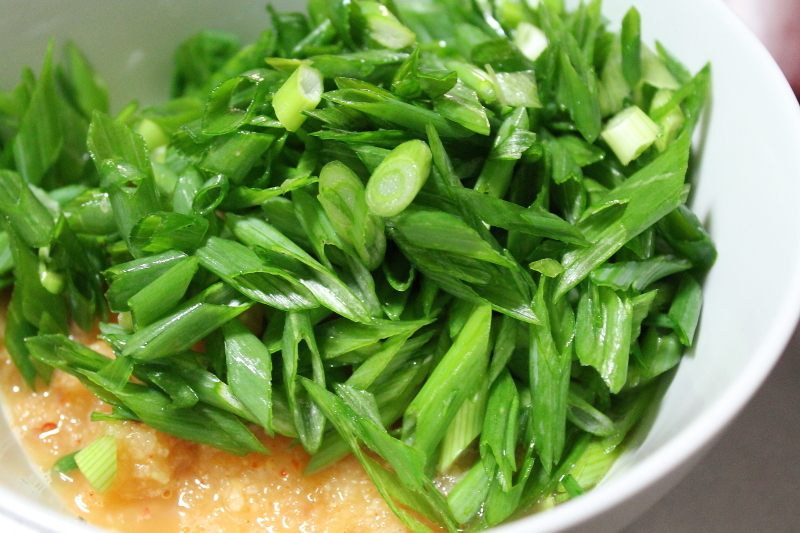 Chop all the ingredients and blend in the food processor. 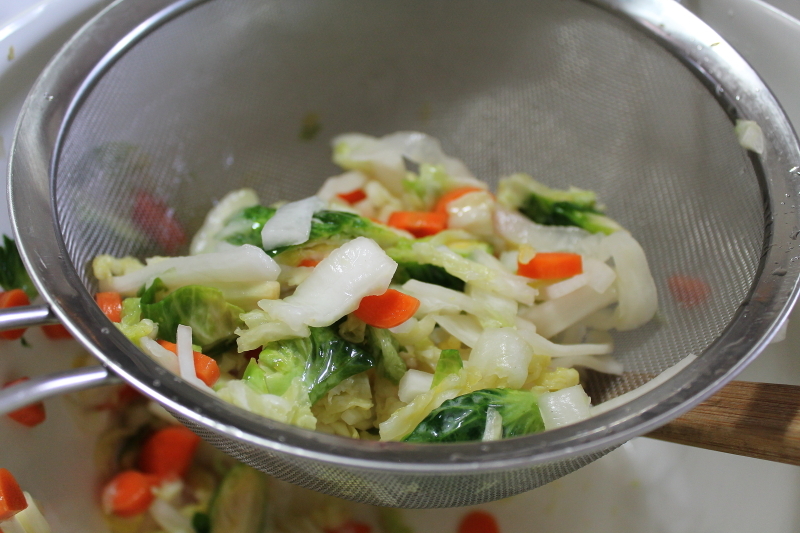 Once the veggies are done, drain with a strainer. Taste to see if it is too salty. If it is, you can rinse with water. Mix with the sauce and pack tightly in jars. 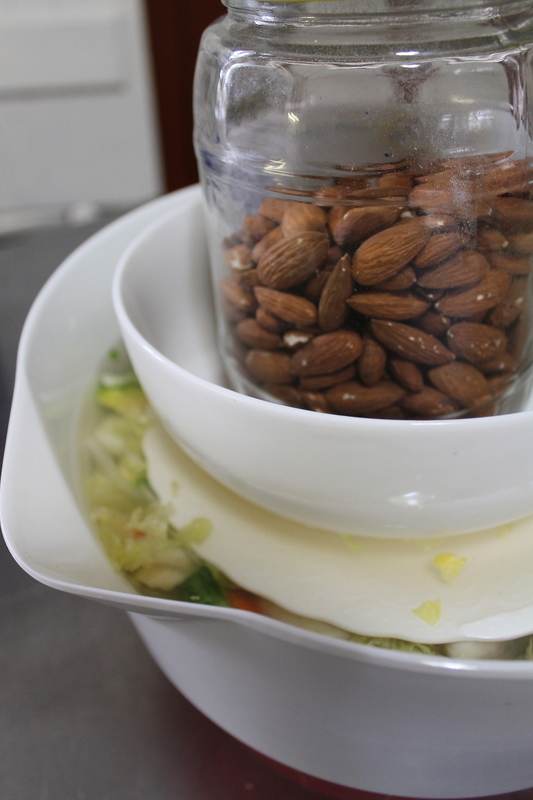 Leave a couple of inches of air space on top as the mixture will start bubbling when it ferments. The smell is pretty stinky when it ferments! 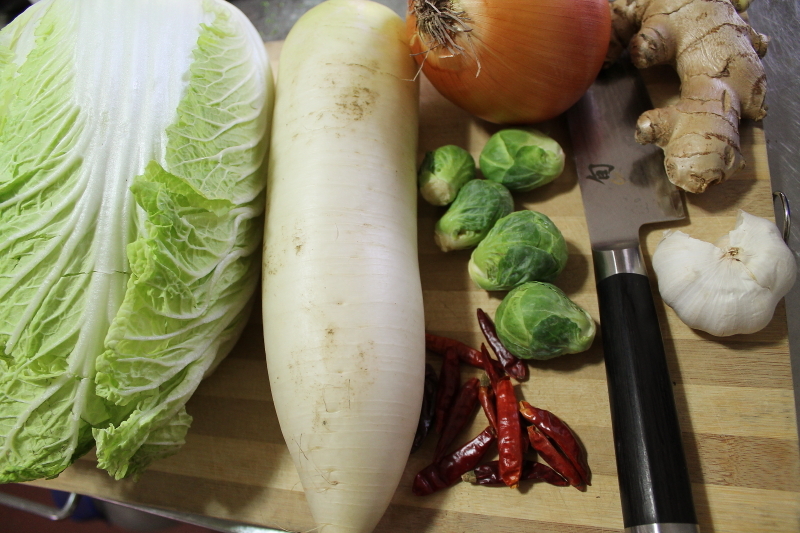 Each day, press down the kimchi to keep the veggies under the brine. Let the mixture sit for about 2 weeks and then the place jars in the fridge. An easier recipe is making cultured beets. Just wash and peel the beets. Pack into jars and cover with brine. Let the beets ferment for about 2 weeks. 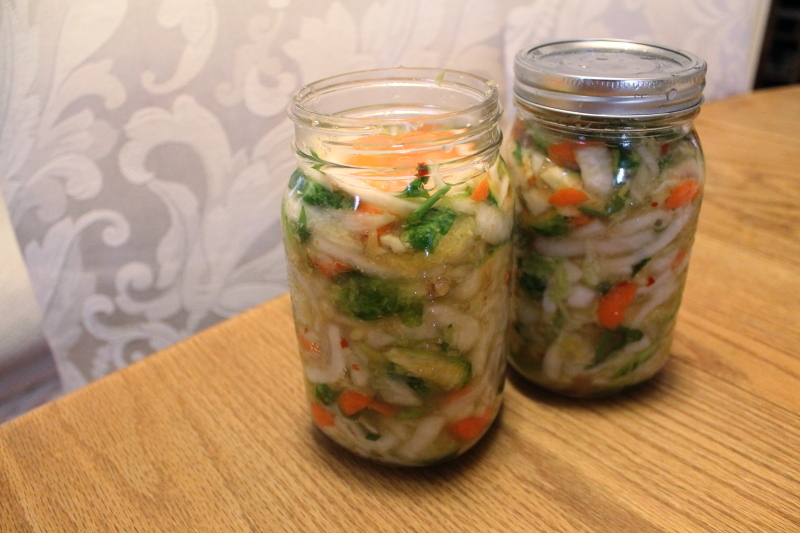 The natural bacteria in the vegetables start the fermentation. Wash your veggies cleanly and chop into bite sized pieces. 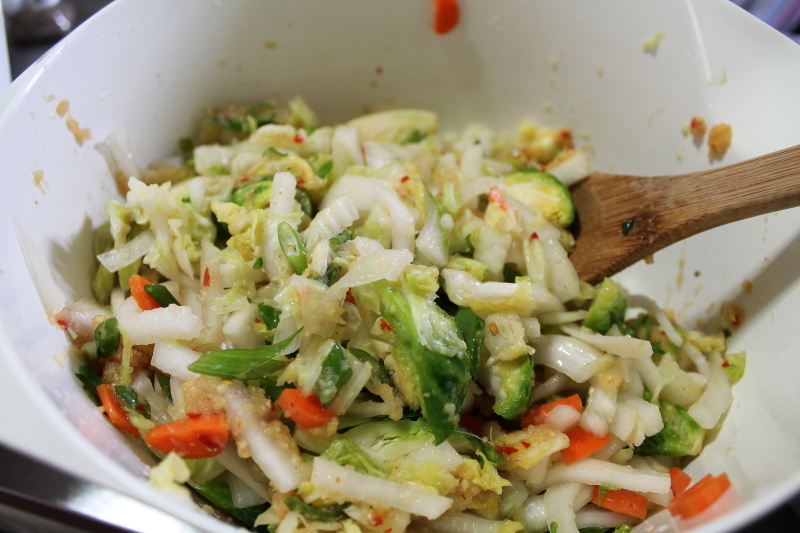 Mix brine and soak all the cabbage, carrots, brussel sprouts and daikon in a bowl. Place a plate on top and press with something heavy. Make sure the vegetables are submerged in the brine. 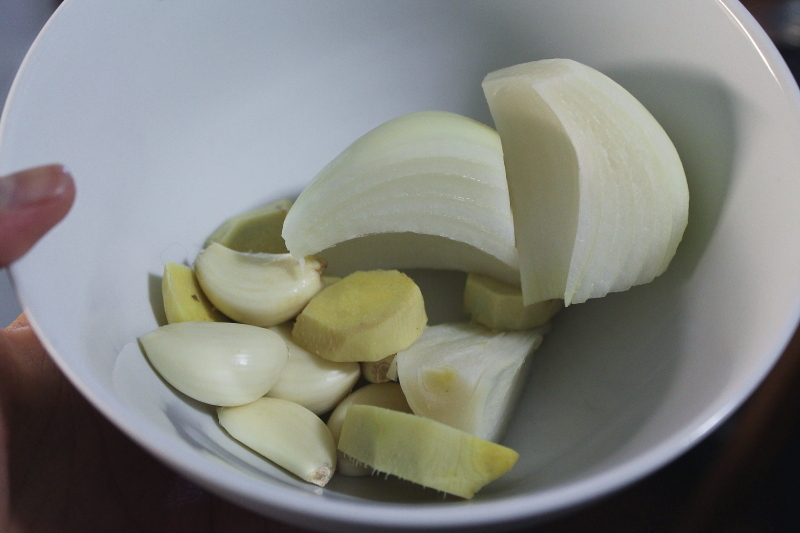 Soak for about 2-4 hours. Drain the vegetables. Taste to see if there is too much salt. 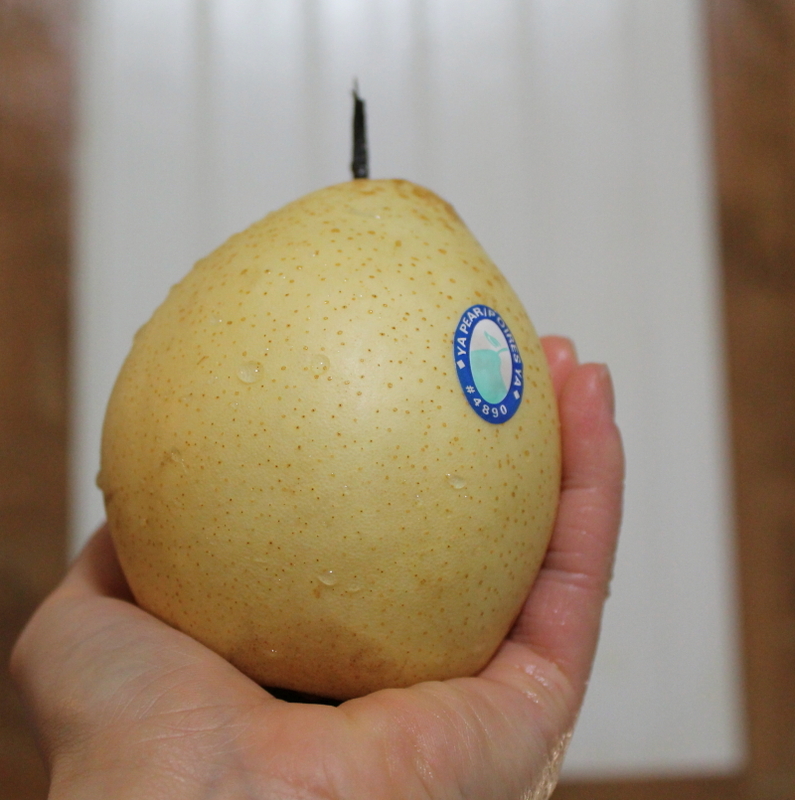 If it is too salty, rinse under water. 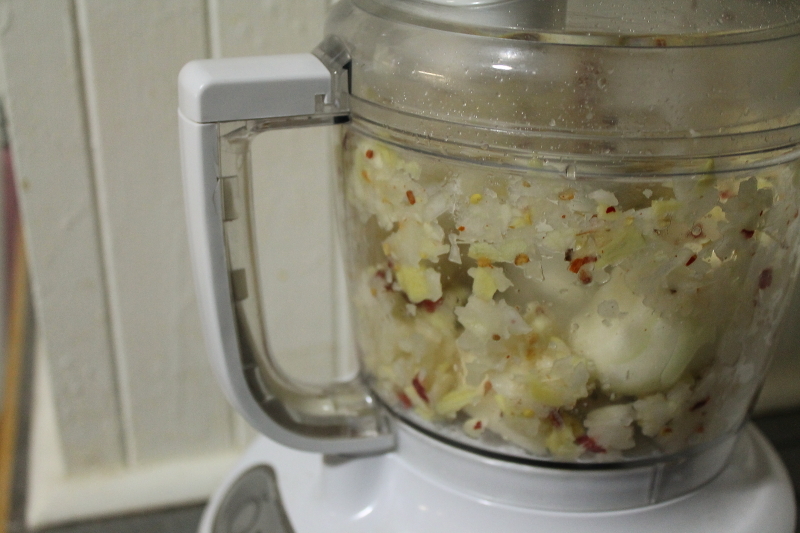 Blend the apple pear, onion, garlic, red peppers and ginger in a food processor. Mix with the drained vegetables. Pack the mixture tightly in jars. 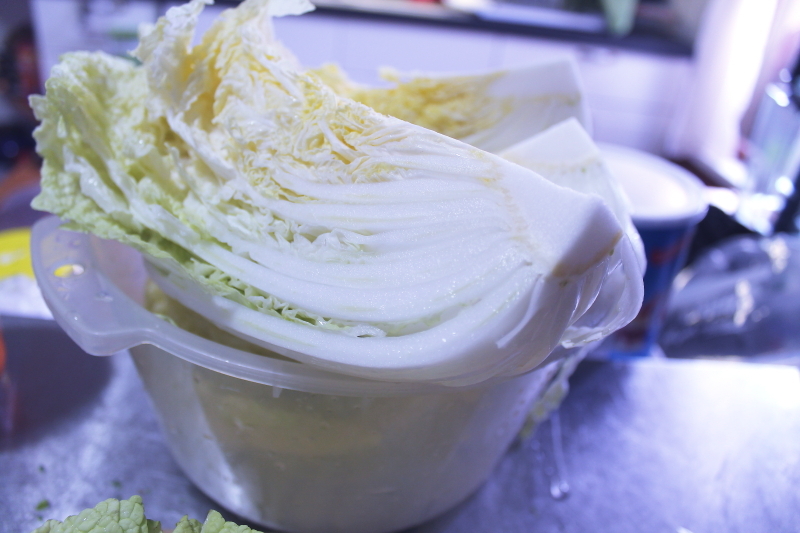 Make sure there is about 2 inches of air space as the mixture will bubble when it ferments. Allow the mixture to ferment for 2 weeks. 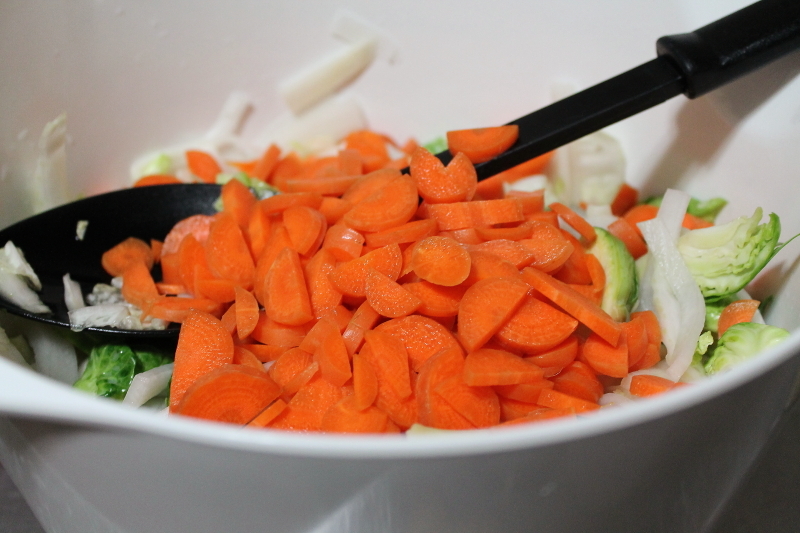 Each day push the veggies down into the brine. This also helps to release some gas from the fermentation. Wash beets and peel skin. 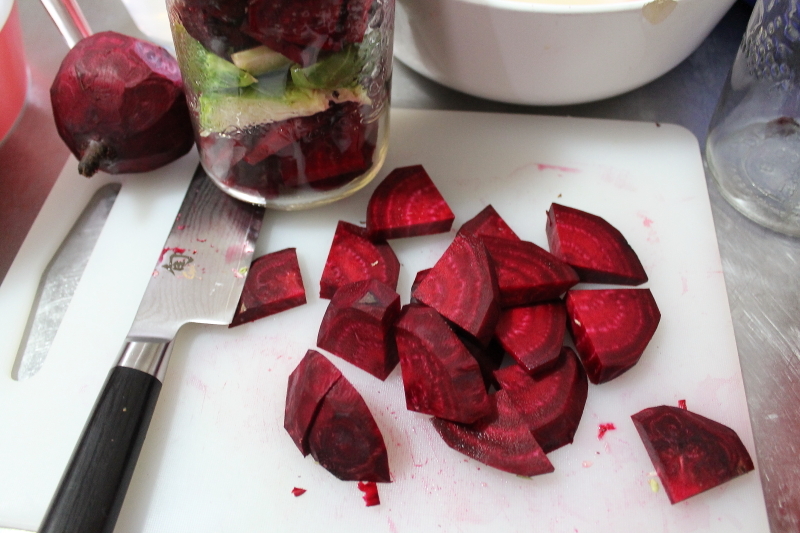 Place beets in jars. Make a brine. (I used the soaking liquid from the kimchi). Pour enough liquid to cover the beets. Let sit for 2 weeks. Each day, push beets into the brine. You can enjoy the beets with salads or as a side. You can also use the liquid in soups or sip it for probiotics. Next Post Beef Barley Soup in a Slow Cooker!